Lori Baker, Ph.D., associate professor of anthropology, who was featured on the National Geographic Channel series, The Decrypters, has worked for the past 10 years with her team of forensic anthropology students exhuming the remain of immigrants that died while crossing the U.S.-Mexico border. 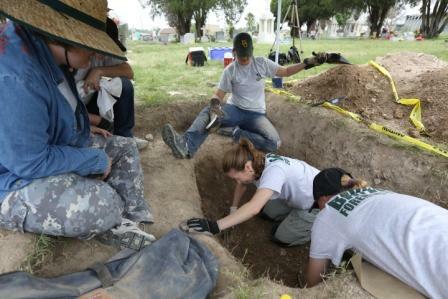 For the past few summers, Baker and her team work in cemeteries in Brooks County, Texas exhuming remains and maintain a repository of more than 100 bodies. Baker and the students conduct anthropological tests and conduct DNA analysis in an effort identify the unknown and repatriate their remains to their families. Baker, founder and executive director of the Reuniting Families Project, has formed a consortium with other institutions to aid the identification work. The identification work and ultimately reuniting families are paramount to Baker. “We love them. We think of them as people. We treat them with respect. We remember where they come from. And, we remember that everyone is associated with a family somewhere that is grieving,” Baker said in a recent television interview.